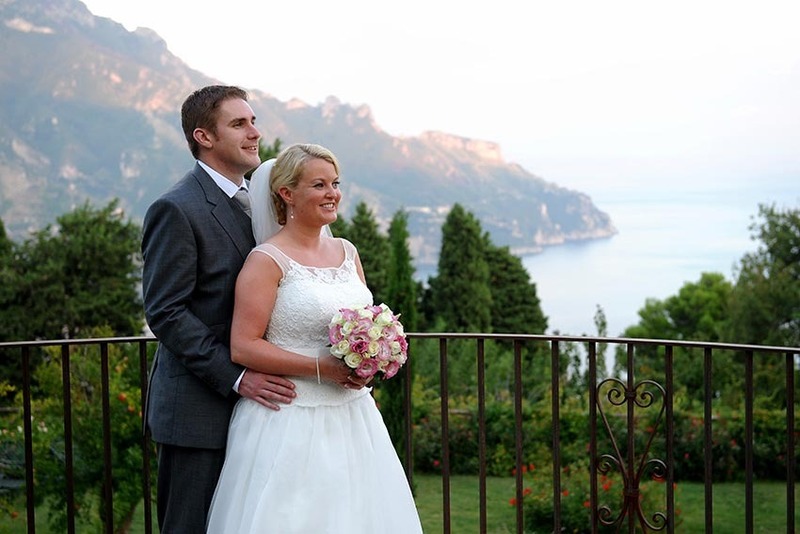 We are back from our wedding in Ravello where we had the most wonderful time. Villa Cimbrone was absolutely stunning and certainly lived up to and exceeded all our expectations. Our wedding meal was beautiful and the service was top class. All our guests were very impressed with both. And what can I say about the surroundings!!!! Stunning. The views and scenery were breathtaking, our photographs are really beautiful. The photographer was so nice, very professional and really knew how to get the best from the surroundings in both the villa and Ravello. He also delivered the photograph disc to our hotel the following evening which we were really not expecting. Highly recommend him!!!! We want to thank you so much for all your recommendations and advice. From the flowers to the hairdresser to the transport (including the buggy!!) everything was perfect and could not have been better organised. Rosie who we met in Ravello was a great help at Town Hall with the paperwork and again at the church on the day of the wedding. She ensured everything ran like clockwork and that we had no stress at all on the day. We cannot recommend your company highly enough and encourage anyone thinking of getting married in Italy to contact you. It was a pleasure to have dealt with you Sara, you were always so prompt with emails and advise and always faced us in the right direction. Thanks a million again for everything.